BRIDGMAN — Chris Betts originally began brewing under the name Transient Artisan Ales about three years ago in Illinois. He would brew out of other facilities by renting space, using his own fermenters and producing his own beer. That small start allowed Betts to save up and buy the building at 4229 Lake Street in Bridgman in July 2015. Artisan soon opened its taproom in the first week of May 2016. Betts started brewing in college his sophomore year with a few friends in his fraternity, before getting a few jobs at bars to learn the craft. Like the wineries in the area, Betts was attracted to Southwest Michigan because of the area’s agriculture. In order to make spontaneous beer, Betts puts beer out from the kettle where it is inoculated with wild yeast and bacteria. It’s then pumped back into wine barrels, where it ferments for up to three years. It’s a type of beer that does best when there’s a good source of yeast in the area. Yeast performs well around good sources of fruit, which Southwest Michigan has an abundance of. Transient’s had a few things to celebrate about. It is no longer a one-man operation. Since opening at the Bridgman location, Betts now has an assistant brewer and a taproom manager. The Bridgman brewery also won two awards at the Festival of Wooden Barrel Aged Beer. They received a bronze for their fruited sour beer with apricot called Foeder 2. Then came the gold medal for a collaboration beer Transient did with Hailstorm, an Illinois brewery. The gold winner was called Agnitio, a farmhouse ale style beer. Betts said he wants the brewery to stay somewhat small and level out their production at about 1,000 barrels per year. Transient also recently switched to its winter hours, which are now 4-8 p.m. on Wednesday through Friday, noon to 8 p.m. on Saturday and noon to 6 p.m. on Sunday. Transient is closed on Monday and Tuesday. Those interested in learning more about the brewery and the beers available for sale can visit the store, stop at www.transientartisanales.com or email Betts at transientartisanales@gmail.com. STEVENSVILLE — There seemed to be something missing in downtown Stevensville that other cities throughout Southwest Michigan had begun to accumulate. With so many breweries popping up in Benton Harbor and St. Joseph, the village on the outskirts of the Twin Cities was one of the remaining municipalities to not have a barley footprint. That changed three months ago, when three entrepreneurs opened the Watermark Brewing Co.
David Cockell, Chris Mason and Justin Schaul had been looking for property for six months when they turned their attention to the Stevensville-Lincoln Township area. There was a building that had tax liens on it that led to a few conversations between the three friends and village officials. Berrien County Treasurer Bret Witkowski was serving as Stevensville’s interim manager when Cockle, Mason and Schaul approached the village in search of viable property. Witkowski told them about the village-owned spot and took them there. Witkowski said the village then used a new law that kept the taxable value the same on the property for a number of years. This helped Stevensville because it was getting a new business while enhancing the tax base. “The village value of that property will be uncapped and be brought back up to value,” Witkowski said. Bringing a business onto the parcels had another benefit. Former Stevensville Village Manager Todd Gardner had borrowed money he wasn’t authorized to do in order to buy the property that houses Watermark. Gardner’s illegal actions came during a stretch of years when he embezzled more than $270,000 from village funds. While Gardner was sentenced to prison on a wire fraud conviction, the land is now benefiting the village from its sale to the restored taxable value. Mason said they closed on the property Nov. 3, 2015, and broke ground on the 7,200-square-foot brewery a day later. It would be another eight months before Watermark would be open. The three entrepreneurs have been brewing together since they met in 2014. Mason and Schaul were living in Chicago at the time and home-brewed together when they discovered each other were obsessed with craft beer. Then they met Cockell, who happened to study biochemistry at Purdue University. It was a perfect storm. Schaul was already working in the hospitality industry in Chicago. Cockell’s education in biochemistry would be a foundation for making the product. Mason, who worked at the Chicago Tribune in its digital media division, would handle marketing. Mason said it was his second job at a popular liquor store that helped with his decision to form a brewery. The beer lineup is ever-changing at Watermark. Within the last three months, they’ve tried more than 30 beer recipes. They supplemented food wants by encouraging food trucks to park right outside the brewery on certain days. It’s kept the beer drinker there longer and brings more business to the village. With this being Stevensville’s first brewery, Witkowski said the community has responded wonderfully. The Village Council could have sold the land for residential housing, but Witkowski said they wanted something commercial that could benefit the other downtown businesses. Watermark would be a way to help change the image and perception of downtown Stevensville. Schaul said they’ve appreciated the community’s reception. As more breweries open up and the craft beer market becomes saturated, Mason said they want to stay as small as they can. For now, all that matters is how the community has adopted the brewery. BENTON HARBOR — Whirlpool Corp. is launching a beer fermentation product aimed at home brewers through a crowdfunding campaign. The Benton Harbor-based appliance maker announced its partnership with Indiegogo to release the Vessi Beer Fermentor and Dispenser system for home brewers. The patent-pending Vessi system ferments, carbonates and dispenses home-brewed beer in as little as seven days – compared to other beer-fermenting methods that can take up to four weeks. Whirlpool launched the Vessi Fermentor exclusively on Indiegogo, a global crowdfunding platform, to engage with early adopters and to test the market for a consumer-driven product that crafts beer. W Labs, a division of Whirlpool that helps bring innovative appliance ideas to life, designed the Vessi system. The Vessi Fermentor includes a single tank system that’s sealed, pressurized and temperature-controlled to craft beer. With its single-tank design, the Vessi Fermentor allows users to reduce key risks in the home brewing process, including contamination, oxidation and imperfect temperatures. The Vessi Fermentor retains the beer’s carbonation throughout the fermentation process, rather than the complicated multi-step carbonation process typically used by other homebrewing systems. As of Thursday, the product has raised nearly $73,000 of the $100,000 goal at its Indiegogo page. According to the product’s Indiegogo page, the Vessi Fermentor’s first prototype was built in November 2015. A month later its first batch of beer was fermented and dispensed. Whirlpool plans to begin production of the Vessi system in October, and it will be launched in test markets Grand Rapids and Denver in November. Initial micro-factory production of the Vessi system will be limited to 200 units per month, and units will be shipped as they become available. The first 200 units will be delivered in December. According to the American Homebrewers Association there are an estimated 1.2 million home brewers who collectively produce 2 million barrels of home brew a year in the United States, and Whirlpool identified a consumer need. As the world’s first crowdfunding platform, Indiegogo was launched in 2008 and is based in San Francisco, with offices in Los Angeles and New York. Jerry Needel, head of Indiegogo’s Enterprise Crowdfunding service, took note of Whirlpool’s initiative in a news release Tuesday. The Vessi Beer Fermentor and Dispenser can be supported on Indiegogo at www.igg.me/at/VESSIFERMENTOR. BENTON TOWNSHIP — Jay Fettig didn’t know if he would be able to open his microbrewery in time for the Senior PGA Championship set to begin next week. 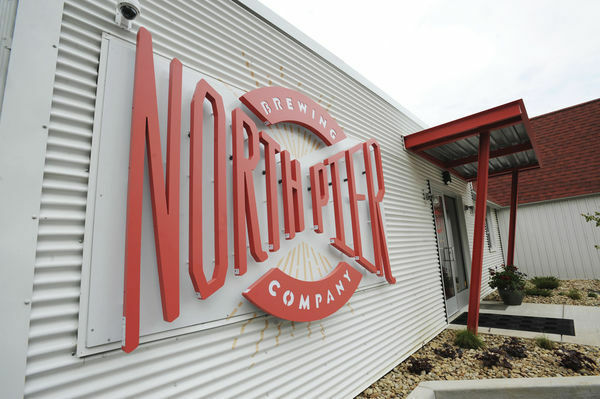 With a bit of persistence, the St. Joseph resident has hosted a few soft openings in anticipation for North Pier Brewing Co.’s official opening Monday. Fettig will certainly get the needed foot traffic new businesses crave when the golf tournament returns to Benton Harbor for the third time in six years. The microbrewery, which is in a renovated building at 670 North Shore Drive in Benton Township, has been a few years in the making. The building has gone from a gas station to a bird house factory to a motorcycle repair shop before it was transformed into North Pier. Fettig put in the work after receiving a special use permit from the township’s Board of Trustees to renovate the building and sell alcohol. Fettig chose the specific building, built in the 1920s, because it’s something he’s driven past nearly every Saturday morning between trips to Harbor Shores. When he looked inside, it was bigger than Fettig thought. He bought the space in July 2015. The microbrewery won’t be large enough to house a kitchen, Fettig said, so the company will team up with North Shore Inn across the street to provide customers with food. When the doors open Monday, North Pier will have six beers on tap. Once the microbrewery gets past its opening week, Fettig said they plan to brew more existing styles to have 12 different beers, add a nitrolized coffee tap and eventually offer homemade soda. Like most breweries, Fettig said they plan for an expansion in the event that they outgrow the available space. North Pier has room for 60 people inside with seating for 24 outside. Including Fettig, North Pier will have three full-time workers and nine part-time employees. One of the signature touches at the microbrewery are the tables and lower part of the bar, which have pieces of wood from Fettig’s uncle’s barn integrated with the setup. Adding to the building’s design and look was important to Fettig. North Pier’s hours will be noon to 10 p.m. on Sundays through Wednesdays and noon to 11 p.m. on Thursdays through Saturdays. Those with questions about the beer list can call North Pier at 269-757-7163 or visit www.northpierbrewing.com. With the official opening day set, Fettig admitted his schedule has been hectic the last few weeks between getting the tap room ready, making sure the beers are brewed and prepping for the arrival of twins. SAWYER — Greenbush Brewing Co. has grown exponentially in the nearly five years it has been in business. That growth will continue this summer as the brewery’s owner, Scott Sullivan, announced in a Facebook post Greenbush acquired Fitzgerald’s of Sawyer as part of its next expansion. Fitzgerald’s and Greenbush are next door to each other in the restored historic buildings in downtown Sawyer. In the newly acquired Fitzgerald’s space, Sullivan said he is bringing the next iteration of food as part of the “diner portion” of Greenbush. The new space will take the best of Greenbush’s brunch menu with breakfast classics added in. At a 7 a.m. start time, Greenbush will begin selling breakfast food through the early afternoon. Greenbush had hosted a few brunch sessions the last few years and chose to offer breakfast food based on the popularity of those sessions. Greenbush marketing dirctor Aaron Darling said the plan is to keep the original Taproom cooking and brewing with a southern-centric focus. Offering several “blue-plate specials” for dinner in the diner expansion, Darling said they will offer bacon-wrapped meatloaf, Yankee pot roast, chicken paprikas and more. In addition to the expansion, Greenbush will sell cider and wine at all three locations. Darling said the wine will come from local and California wineries. Darling said 41 people were hired in anticipation for Greenbush’s summer opening at the former Fitzgerald’s restaurant and bar. The diner portion of Greenbush should open sometime in June to coincide with the brewery’s five-year anniversary. 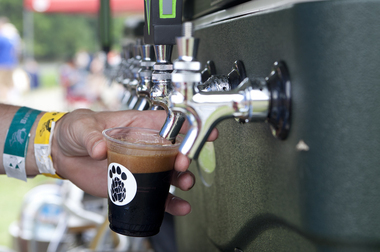 On June 10, Darling said Greenbush will hold a large anniversary party. After eight years serving Harbor Country and its visitors, Fitzgerald’s made a Facebook announcement it would close and hand over reins to Greenbush. When Fitzgerald’s first went up for sale two years ago, Darling said several people came by asking if they were going to buy the property. Two years ago the timing wasn’t right because Greenbush had already opened the Annex across from the Taproom, Darling said. “It became apparent over time that Fitzgerald’s would be the perfect fit,” he said. “Initially, Greenbush was going to be a small taproom. Sullivan and others would serve (customers) the beer, talk about it and go brew more beer. That lasted maybe a day. BERRIEN SPRINGS — Two years and another seven months. That’s how long Nick Kuhn has been waiting to unleash Cultivate Brewing Co. to the public. It was two years spent seeking approval and gathering the financial backing he needed, with an additional seven months spent on renovations. As owner of the brewing company, Kuhn already runs a real estate management business in Chicago, but says this new venture into barley and hops has always been a passion of his. While the opening date for company at 961 E. Shawnee Road in Berrien Springs remains unannounced, Kuhn said it is set to arrive shortly. 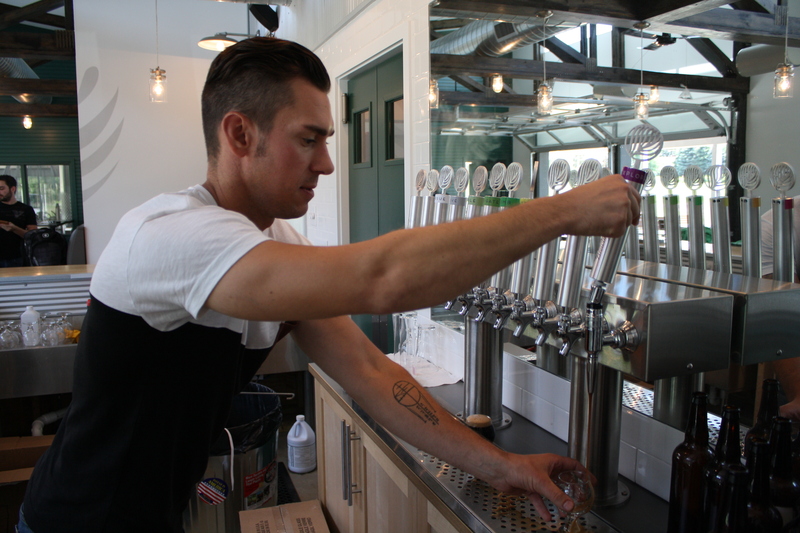 Cultivate Brewing is considered a working farm, growing its own barley and hops on premise. Kuhn said he wants craft beer enthusiasts to enjoy this new way of being a part of the craft process. Cultivate Brewing is stationed on an 18-acre farm and will allow visitors to walk through the hops and barley being grown on site. The idea was to merge the two concepts of great soil for growing and the surge in the hops industry. A barley field can be seen next to the brewery, with a nature trail feeding around it to allow drinkers to walk through and read signs about the barley they are consuming. Nicholas Dumon, brewer and St. Joseph resident, was living and working in Chicago when he first heard about Kuhn’s idea. Dumon was teaching a brewing class when Kuhn and a few of his friends stumbled into the course. A few days later Kuhn came back and made Dumon an offer. The site is not all farm though. Cultivate Brewing has a shaded-porch area that seats 50, a tasting room inside that can fit up to 50 people and a patio outside that can hold 60. Kuhn said the brewery will start out by offering nine traditional styles of beer. It won’t serve food in a traditional restaurant sense, but will include snacks. Tasting room hours will be from noon to 8 p.m. on Tuesday through Sunday. The brewery will welcome walk-ins, but Kuhn asks people to schedule reservations for groups of eight or more. Kuhn said he has always been interested in the creative process of taking nothing and making it into something tangible. To learn more about Cultivate brewing Co., visit its website at www.cultivatebrewing.com/locations.